"I'll get the two-egg omelet, with a side of black pudding and coffee." I have no idea where I was when I ordered this, but I do remember the conversation with my two college friends, Mikey and Jim, that followed. "You know what that is?" asked Mikey. "The pudding? No," I truthfully replied. It followed bacon, ham and sausage in their listings of meat sides on the menu, so it seemed to be in good company. 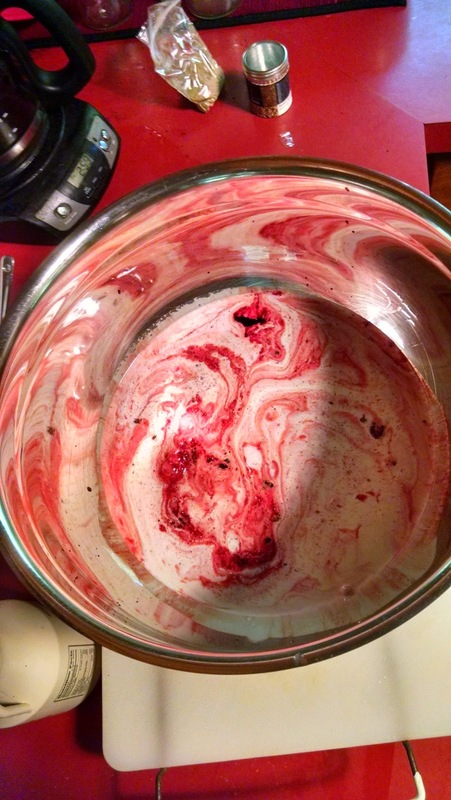 "That's cooked blood," Mikey informed me, with the verbal intonation that I had just ordered a drowned rat. "You'll like it; it's good," came Jim, encouragingly. "I get it a lot at the Greek diners home on Long Island." "It's a Greek thing?" I asked. "Nah, but you can get anything at a Greek diner." When the plate came, two little black rounds were served to me on a tiny ceramic plate. They tasted meaty, salty, and completely non-threatening. 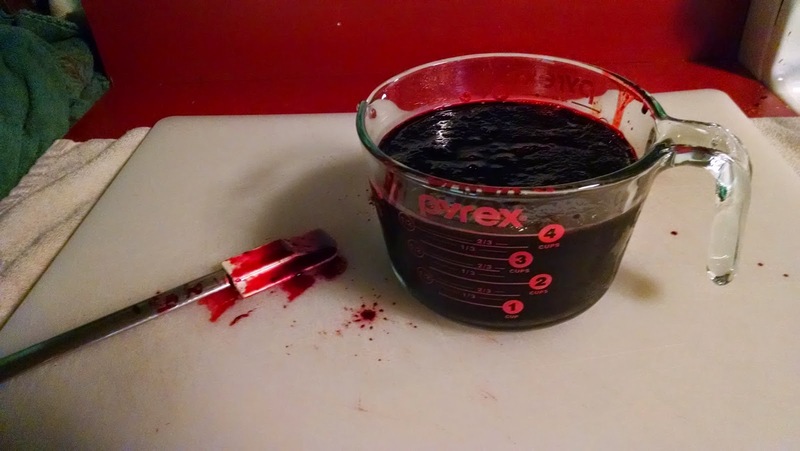 But, as with a lot of organ meats and odd cuts, blood makes people turn their nose up, again like I was offering up a drowned rat at the potluck. This also means that it's hard to get black pudding, blood sausage, etc, as most people don't want it. Whenever I've seen it on a menu since, I've ordered it, and still probably only had it six or seven times in my life. So when I saw North Woods Ranch was selling their Berkshire blood by the pint, I was thrilled! Bringing the order home, Carla asked if I picked up a couple. "I'm....I bought ten pints," I confessed. "Of course you did," she gently teased me. I have a very understanding wife. While at Pigstock, I helped to collect and chill the Mangalitsa blood, and then assisted a bit with making head cheese with blood and a large diameter blood sausage. 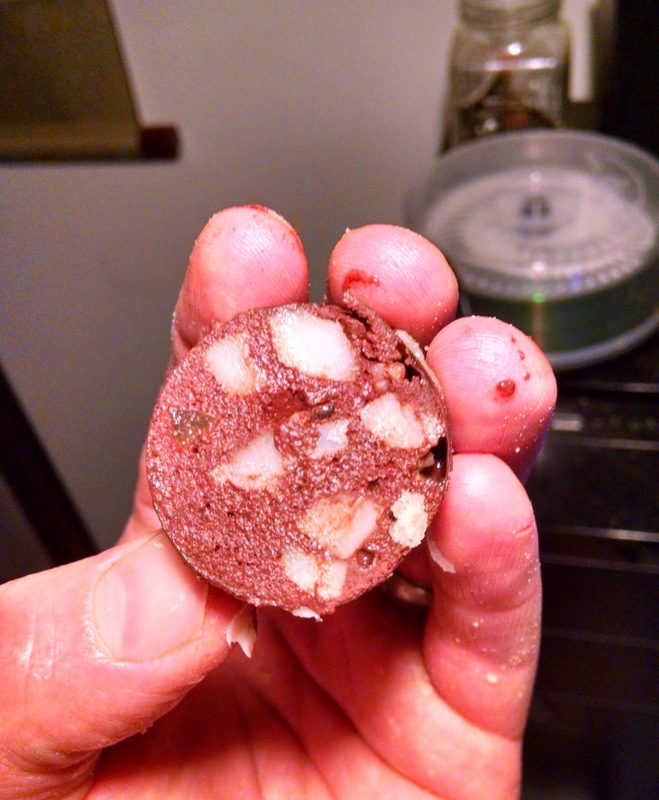 But I've never actually made blood sausage by myself, start-to-finish. I went with a classic Boudin Noir recipe from The River Cottage Cookbook, as it seemed to be the simplest and most straightforward. 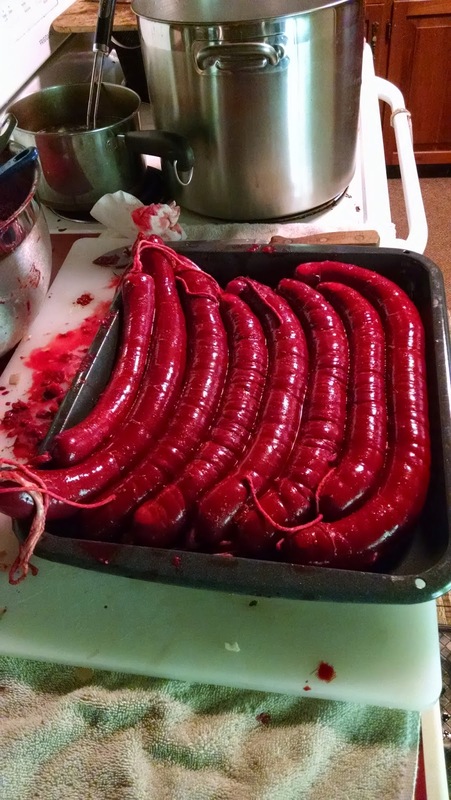 In reading various recipes, the main area of disaster in making boudin noir seems to be in the poaching. Too high of heat and the sausages will burst. The Au Pied de Cochon cookbook remarked that if you have a large enough volume of water at a boil, you can just turn the heat completely off and the residual heat will cook the sausages through. I tried that method in my three gallon pot and it worked perfectly. The water was still above 200 F when I lowered in the cold boudin noir, which rapidly dropped the heat down to 180 F. After about 20 minutes the sausages' internal temps were just peaking over into 160 F.
Slicing one open, it looked beautiful. Creamy, brick red, and dotted with small, tender cubes of Berkshire fat. 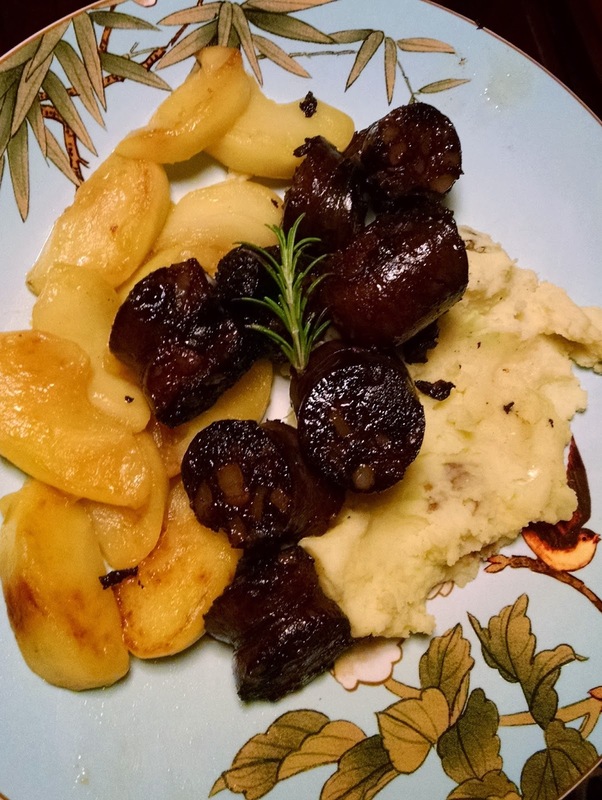 For dinner that night, I went French Bistro style and sauteed the boudin noir to serve with mashed potatoes and sauteed apples. The next day for lunch I tried it more casually, on half of a whole grain baguette with pickles and lettuce. Taste-wise? Well, while I'm sure I can improve as time goes on, I can honestly say this was the best boudin noir/black pudding/blood sausage I have ever had. Not to sound arrogant, as I don't think it was so much my skill, but the freshness of the final product. A lot of blood sausage is frozen and shipped from the few plants that do make it in California or New Jersey, then thawed out and reheated. The comparison would be buying frozen, vacuum packed scallops compared to cooking a scallop fresh - the initial quality begets the quality of the final dish. 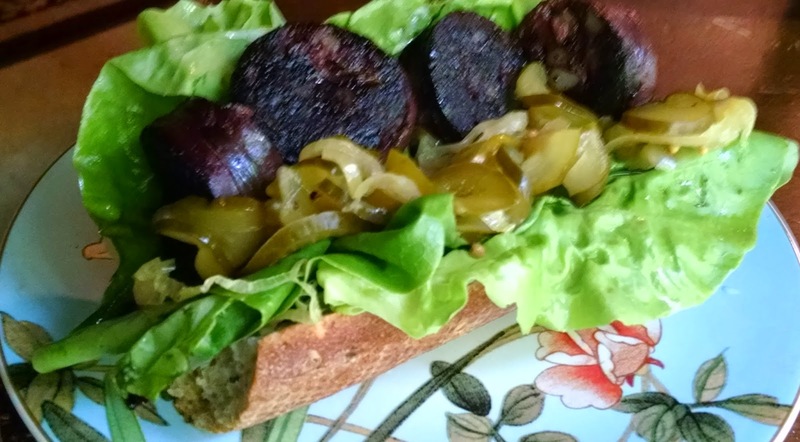 The boudin noir was delicate, gently spiced, and surprisingly light. Also, my house looked like a crime scene at the end of the day. I'm going to need to get a Tide stick next time I make this.